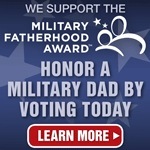 Honor a Military Dad from Fatherhood.org. Home » Father » Honor a Military Dad from Fatherhood.org. I just had a good talk with Vincent DiCaro at the Fatherhood Initiative. They work to support involved dads and motivating others to be the best dads they can be. They are honoring military dads with a Military Dad Award. Please take a look if you know a military dad who deserves an added honor as a dad. Along with all the costs of war, we also don’t talk much about the effect on families, kids and dads (and moms). Being a dad has many challenges, but I am grateful that one of mine is not trying to stay in touch with my family while dodging bullets. Our friend, Armin Brott, a former Marine, recently wrote a book on The Military Father to help dads and military families prepare for a deployment and manage the situation as best they can. The Fatherhood Initiative also has materials to help military dads.